Which products will wow crowds, convert prospects to customers, and please employees in 2019? You never know, but here are 8 trending items I predict will be popular this year. One of the best parts of my job is helping my clients stay cutting edge when it comes to promoting their businesses. Not to brag, but over the year's I think I've gotten pretty good at knowing which products will trend, and which products will flop (I'm looking at your fidget spinners). In the promotional items business, of course there's going to a few of you who insist on sticking with the staples (pens, calendars, apparel, etc.). But if you want to stand out, you have to take a risk. So if you're the type of business who's brand calls for trendy promotions, or you're just tired of the same old same old, you may want to check out a few of the ideas in this post. And as always, contact me if you need help placing an order. -Rachel. Below are my predictions for the hottest promotional products of 2019. PopSockets - Hot in 2018, looking to be even hotter in 2019. Extremely popular with Gen X and Millennials, but great for anyone. 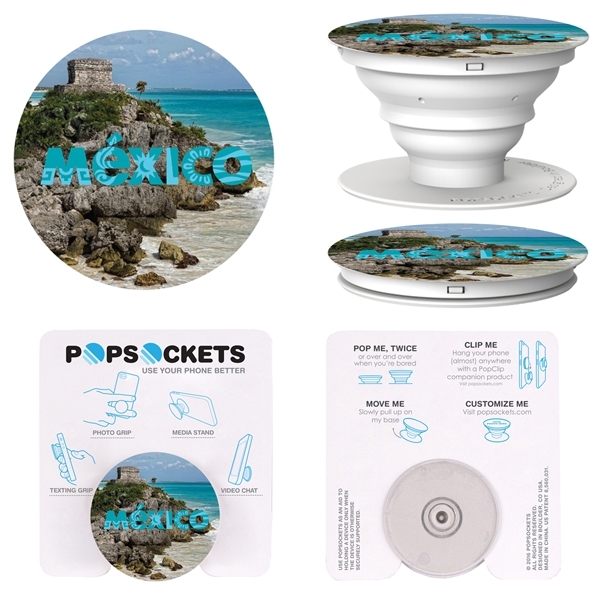 Once you experienced a popsocket, you'll wonder how you lived without one. Vacuum Wine Tumblers - A classy way to keep any drink hot or cold. Available in 5 colors, these stemless vacuum wine tumblers are great for wine or any beverage. Take your beverages on the go in style this year. Water Bottles - People can't get enough of these. The Basecamp Tunda is one of my favorite water bottles. It comes in 15 amazing colors, and features insulated lining and a unique carrying handle lid. Qi Chargers - Wireless charging finally becomes main stream in 2019. I've been talking about wireless charging for a few years and 2019 looks like the breakthrough year. The Zoom Wireless Charger is a great option. Moleskine® Notebooks - Everything old is new again. Still keeping things analog? You'll love this MoleSkine Notebook with hard cover. Very popular with the IT crowd and Pharma companies. Personalized Socks - We're seeing a huge surge in popularity this year. Get a foot up on your competition with these knit-in logo crew socks. They're available in 30 colors and can be customized with your mascot or logo. Mini-Watering Cans - Environmently friendly and super fun! Great for environmentally friendly companies, this metal watering can contains a blossom kit and can be used over and over. A great green giveaway. Adult Coloring Kits - Take a break from technology and get creative. Not just for kids anymore, adult coloring books can relieve stress and make a fun and memorable giveaway at trade shows and expos. Looking for more ideas? Check out last year's list.